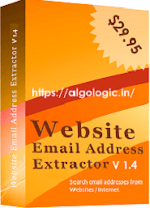 Outlook Email Address Extractor is a best tool to extract email address from outlook. 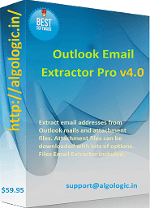 Outlook Email Address Extractor can export all email address from outlook accounts configured in microsoft outlook. Outlook Email Address Extractor allows users to select any email folders from outlook to extract email address from Recipients, CC, BCC and mail body of outlook email. 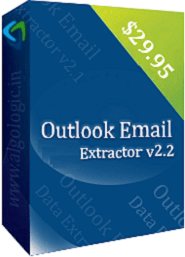 Outlook Email Address Extractor v2.2 also have options for extract valid email address from outlook. Outlook Email Address Extractor filter removes garbage email address and gives a list of email address you want. Duplicate email address automatically eliminated. Outlook Email Contact Extractor v2.2 is email address extractor software to export email contacts from outlook. Extracted email address/contact can be saved in EXCEL/CSV/TXT formats. Outlook Email Address Extractor supports any version of Outlook as Outlook 2003, Outlook 2007, Outlook 2010 and Outlook 2013. Supports Outlook version such as Outlook 2003 / 2007 / 2010 / 2013 / 2016 and Office 365. Allows you to select any mail folder(s) from Outlook to extract email addresses. Supports filter option to have only valid email addresses from Outlook. 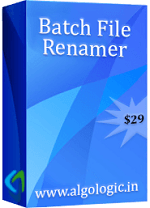 It eliminates duplicate and garbage email addresses automatically. It export outlook email addresses / contacts to excel (.xls). Extracted email addresses can be saved in excel (xls), .csv file and text file. Not more expensive than your valuable time and email contacts in Outlook. 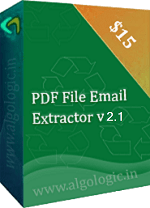 PDF Email Extractor is a software to extract email addresses from many PDF files from your computer. Extracted email addresses can be saved in Excel, CSV and TXT file. It works for any version pdf files. Trial download available for Windows. 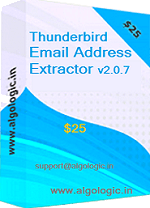 A best software to extract all email addresses from email subject, recipient, sender, cc, bcc and mail body of Thunderbird emails. Extracted email addresses list can be saved in excel / csv / txt files. It provides you a valid and required email addresses from Thunderbird mails. 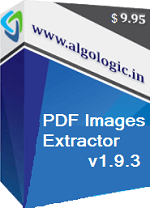 PDF Images Extractor v1.9.3 is the best software available on internet to extract images from pdf files in any image format (JPG, PNG, BMP, GIF, EXIF, TIFF). It is available for free trial download. AlgoLogic is an utility software development company. We have developed Email Address Extractor for Outlook, Thunderbird, Websites and document files such as PDF, Excel, Word, PowerPoint. 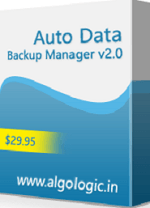 Auto Folders Sync Scheduler, Multiple Files Renamer, PDF Images Extractor, PDF Text Converter etc.